Tanganyika became a Sovereign State on 9th December 1961 and the People’s Republic of Zanzibar was established after the Revolution of 12th January 1964. The two Sovereign States formed the United Republic of Tanzania on 26th April 1964. 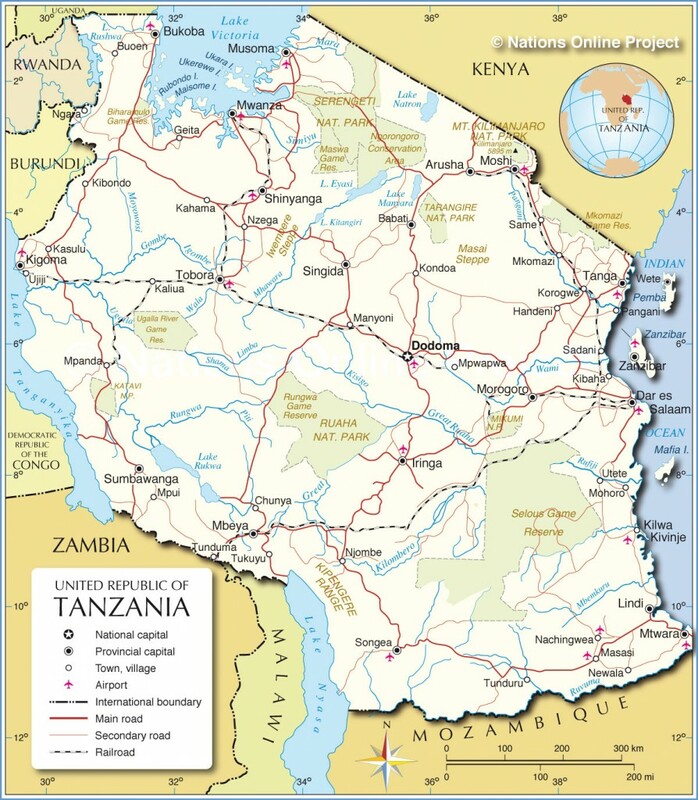 At 947,303 square kilometres (365,756 sq mi), Tanzania is the 13th largest country in Africa and the 31st largest in the world, ranked between the larger Egypt and smaller Nigeria. It borders Kenya and Uganda to the north; Rwanda, Burundi, and the Democratic Republic of the Congo to the west; and Zambia, Malawi, and Mozambique to the south. Tanzania is located on the eastern coast of Africa and has an Indian Ocean coastline approximately 800 kilometres (500 mi) long. It also incorporates several offshore islands, including Unguja (Zanzibar), Pemba, and Mafia. The country is the site of Africa’s highest and lowest points: Mount Kilimanjaro, at 5,895 metres (19,341 ft) above sea level, and the floor of Lake Tanganyika, at 352 metres (1,155 ft) below sea level, respectively. The President of Tanzania and the members of the National Assembly are elected concurrently by direct popular vote for five-year terms. The vice-president is elected for a five-year term at the same time as the president and on the same ticket Neither the president nor the vice-president may be a member of the National Assembly. The president appoints a prime minister, subject to confirmation by the assembly, to serve as the government’s leader in the assembly. The president selects his or her cabinet from assembly members. All legislative power relating to mainland Tanzania and union matters is vested in the National Assembly, which is unicameral and has a maximum of 357 members. These include members elected to represent constituencies, the attorney general, five members elected by the Zanzibar house of representatives from among its own members, the special women’s seats that constitute at least 30% of the seats that any party has in the assembly, the speaker of the assembly (if not otherwise a member of the assembly), and the persons (not more than ten) appointed by the president. :§ 66(1) The Tanzania Electoral Commission demarcates the mainland into constituencies in the number determined by the commission with the consent of the president. Tanzania’s legal system is based on English common law. Tanzania has a four-level judiciary. The lowest level courts on the Tanzanian mainland are the Primary Courts In Zanzibar, the lowest level courts are the Kadhi’s Courts for Islamic family matters and the Primary Courts for all other cases. On the mainland, appeal is to either the District Courts or the Resident Magistrates Courts. In Zanzibar, appeal is to the Kadhi’s Appeal Courts for Islamic family matters and the Magistrates Courts for all other cases. From there, appeal is to the High Court of Mainland Tanzania or Zanzibar No appeal regarding Islamic family matters can be made from the High Court of Zanzibar. Otherwise, the final appeal is to the Court of Appeal of Tanzania. Mainland and union judges are appointed by the Chief Justice of Tanzania,[ except for those of the Court of Appeal and the High Court, who are appointed by the president of Tanzania. The Legislative Council has two parts: the President of Zanzibar and the House of Representatives. The President is Zanzibar’s head of government and the chairman of the Revolutionary Council, in which the executive authority of Zanzibar is invested. Zanzibar has two vice-presidents, with the first being from the main opposition party in the house. The second is from the party in power and is the leader of government business in the House.